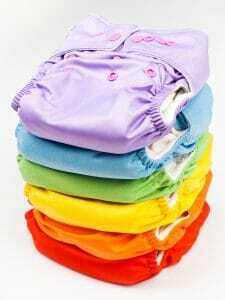 There are so many styles and different acronyms for describing cloth diapers that it can quickly become confusing. Don’t let this deter you from using cloth, it’s really easy to do, once you get over the initial overwhelm. Cloth diapers no longer mean pre-folds and plastic covers. There are so many different types nowadays, with many different cute designs and fun fabrics. Here are the basics of cloth diapers. There are several different types of cloth diapers. This diaper contains everything needed to diaper your baby in it. You don’t need to add stuffers or put a cover around the outside. It is absorbent enough for daytime use and has an outer shell on it to contain all the wetness. If your baby is a heavy wetter, you can gain some additional absorbancy by laying in an insert to the diaper. This type of diaper is the one most like a disposable. The cons for using this type of diaper is that in my experience it doesn’t get as clean as other diapers and holds on to odors more. They can also take a long time to dry. Very similar to an all in one, except the absorbancy is from an insert that is sewn in at the back of a diaper. I have found that this type of diaper dry’s quicker than an AIO. This diaper has a “pocket” to add an insert into. There are a couple different styles. Some have an opening at the back waistband of the diaper and others have an opening on the inside of the diaper. I found pocket diapers were my favorite diaper to use. A fitted diaper needs a cover over it. As far as the diaper itself goes, it can be similar to the AIO – where all the absorption is inside the diaper, it can be similar to the AI2 with a sewn-in liner or even similar to a pocket diaper that you need to stuff. The difference is, it doesn’t have the waterproof barrier outer layer so it needs a cover. Layers of fabric are sewn together with extra absorbency sewn down the middle. You need to use either safety pins or a snappi to keep these closed and they also need a cover over the outside. Flats are similar to prefolds, but they don’t have extra absorbency sewn into the middle of them. They are layers of fabric sewn together. There are all sorts of ways you can fold these diapers to make it work well for your baby. These also need either safety pins or a Snappi to close as well as needing a cover. This goes over fitted diapers, prefolds and flats to prevent leaking and keep all the moisture contained. You can find covers made from PUL (polyurethane laminate), wool or fleece. This is a diaper that has a waterproof cloth shell and a disposable insert. With so many different styles, how do you decide which cloth diaper is right for your baby? Honestly, you have to try different ones out. Buy a few different brands and styles to try out. You will find you like some more than others. Brands will fit differently, so if you are trying out the AIO’s and try a brand and it leaves red marks on your baby, try another AIO from a different company. This may fit your little one better. If you have a chunky monkey (like all my kiddos were), you might find that not all diapers are going to fit your little one the same as someone who has a long and lean baby. For the newborn stage, I went with what I felt was the absolute minimum possible at 12 diapers. I knew though that my family has large babies (I was 10.5lbs and all 3 of my boys were between 8.5lbs-9.5lbs) and that in general, we grow big babies. So within 2-3 weeks, my babies were out of newborns and into smalls. If I knew that my babies were most likely going to be smaller sized and my family didn’t tend to have chunky monkeys, I would have increased the number of diapers to 24. At 12 diapers I was doing laundry every day (sometimes 2x/day). I’ve always tried to change my babies as soon as they were wet and yes, multiple times I would change my baby and two seconds later he would be wet again so I’d change him again. Some days we went through more diapers than other days. For smalls, I had about 24ish diapers. For mediums, my goal was to get to around 36. I started with 20 and would add to my stash when I was able to. My goal was to be able to wait 3-4 days in between washing diapers. 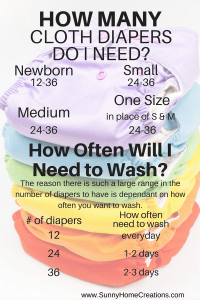 36 is a great number because while sometimes I would go through all 36 and need to wash diapers, other times I would have a few extra still on my shelves or in my diaper bag when I washed my diapers. I changed to the one size (OS) diapers gradually and honestly wish I had just started with these. This covers both small and medium size with my kids and worked really well. If you are dealing with a diaper rash you need to be careful what you use if you are using cloth diapers. First off, make sure your baby’s bum is totally dry before putting a diaper on. Many times diaper rashes are caused from excess moisture. If your little one is getting a lot of diaper rashes, you can try changing to more breathable diapers. So a diaper with either fleece or wool as the outer layer. Or using a fitted diaper with no cover if it’s a warm day and your baby can go without any pants for a bit. Making sure your baby has some diaper free time is also great for helping clear up a diaper rash. As far as ointments go, many of the ointments can get into the fabric and repel the urine instead of absorbing it. Even when you clean the diaper, the ointment won’t wash out. There are a few diaper rash ointments that do work well with cloth diapers. CJ’s BUTTer was our favorite. Some other ones worth trying would be Earth Mama Diaper balm or Honest Company Healing Balm. When laundering your cloth diapers you need to be aware of a few things. First off, unless your baby is EBF (exclusively breastfed – aka no solids or formula) you need to make sure the solids – aka poop is scraped/cleaned off into the toilet. If your baby is EBF, then the poop will come right out in the wash. This sounds gross, but it’s true. As soon as you add anything other than breastmilk to your baby’s diet though, you need to make sure to clean the poop from the diaper before washing it. Using a splash shield and a diaper sprayer makes this pretty easy. You attach the diaper to the splash shield with clips, then spray the poop off the diaper with the diaper sprayer. I would let the diaper drip dry for a little bit then move it into a diaper pail lined with a wet bag. Related: Increase Your Breastmilk Supply Fast! We used a diaper sprayer, although ours was a DIY version of attaching a kitchen sprayer to our toilet. They actually make diaper sprayers now. Here is one similar that has all the connection pieces that you need to attach it to your toilet. We also had a bucket that we would clip the diaper to when using the diaper sprayer. For the bucket my husband cut out the bottom of one of those Home Depot type buckets (they are a lot cheaper in the actual store – try Home Depot, Lowes or even Wilco carries something similar), we bent the bottom to make it fit into our toilet and we just used clothesline clips to hold the diapers. I’ve also seen people use a small garbage pail pretty much the same way. They removed the bottom, added some chip clips to hold their diapers on and they were good to go. Our bucket wasn’t very high tech (or pretty) at all, but it worked and it was super cheap. If you want something that looks a bit better and you don’t want to spend any time making, here is one that works well. If you are using pockets, they need to be unstuffed before putting into the washing machine. The laundry detergent you use is important. You don’t want to have your cloth diapers build up with soap residue or get the awful ammonia smell. I’ve used BioKleen in the past with great results. You can reference this chart to see if your laundry detergent is recommended. So what is stripping diapers and why or when would you need to strip cloth diapers? If you end up with diapers that are repelling due to some diaper ointment that won’t come out or some other reason. Or if you have a lot of detergent build up in your cloth diapers you will want to strip them. Stripping diapers just means to get rid of any soap residue or anything else that might be making your diaper either stink or repelling liquid. It’s super easy to strip your cloth diapers. You are going to want to make sure you are starting with clean diapers. I used to wash my diapers then strip them right after they were done in the washing machine. 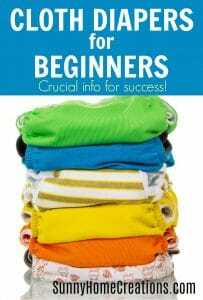 You can wash your cloth diapers in HOT water and add some dawn dish soap to the laundry load. Add about 2 tablespoons. After the cycle is complete, run another cycle and check on the load – when the load is agitating, you want to look and see if you see any bubbles in the machine. You are wanting to keep rinsing the diapers until there are no more suds when the water is agitating. A tip my friend passed on when I kept getting ammonia smell in my diapers was to use a squirt around the basin of Bac-Out from BioKleen. I found this to be an effective way of keeping the ammonia smell gone. What brand of cloth diaper is the best is completely subjective. They tend to all fit slightly different. One of my best friends when our kiddos were babies absolutely loved gDiapers. The owner of gdiapers was local to us and she not only found a diaper she loved, but the whole gdiaper community was “her people”. I tried gDiapers and they left red marks on my son’s thighs. They weren’t right for my kids. Although, I loved using the disposable inserts in my cloth diapers when my youngest had a yeast rash and I couldn’t find anything cloth diaper safe to use. There are so many cloth diaper companies out there and it seems to be expanding all the time. I LOVE the diapers from WAHM’s (work at home mom’s). Hyena Cart was really popular when my kids were in cloth. It appears almost like a ghost town over there now, but there are still some cute diapers listed and for reasonable prices. Etsy has a lot of WAHM diaper makers as well. Some towns have children’s stores that carry cloth diapers from local WAHM’s. You can go in and ask questions and find out what the feedback is from customers in the store, which is always a plus. Some friends have had really good things to say about Kelly’s Closet, Nicki’s Diapers and Jillian’s Drawers. And of course, there is always Amazon. I hope this helps answer some of your questions about cloth diapers and clears up some of the mystery and confusion about using them. I personally found them super easy to use and the positives for me far outweighed any negatives. There was a bit more time involved since I had to do laundry, but I may have been using that time anyways with disposables from running to the store to buy them. I find the smell of disposable diapers nauseating and I didn’t find that to be so with cloth diapers. If you have any other questions, let me know in the comments below. If you found this helpful, I’d love for you to “Pin It”!